Tarot is a deck of 78 cards that has become a popular method for seeking guidance or by tapping into our natural consciousness. By studying the images on the tarot cards the reader access a part of our mind that ordinarily tends to be ignored. The tarot is a tool that allows a reader to enter a reflective state in which fresh insight into our physical reality can be gained. Tarot readings are searches of possible future events using a Tarot deck. The cards are shuffled while asking a specific question that an answer is sought for. The cards are then laid out in one of a number of different layouts or Tarot spreads. The Tarot reader then interprets the cards for the question asked. It does not ask you to perform any kind of pooja’s. You shuffle the card yourself thus it brings you in the positives of the deck. As an indicator a Tarot reading will show the most likely outcome if you follow the path you are currently on and do not deviate from it. 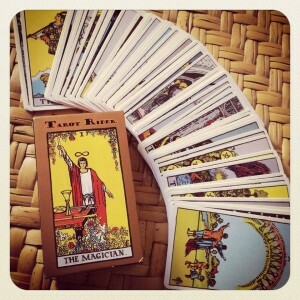 Tarot reading sessions will be conducted on per hour basis. Sessions will be conducted by prior appointments only and will be conducted between 11 am to 6 pm only. Quick introduction to the original Rider Waite Tarot cards. Identifying the cards – Major and Minor Arcana. 56 minor arcana and its four divisions. 156 ways of interpreting cards. Five elements and their connection with tarot cards. Zodiac signs associated with the tarot cards. Framing the questions for accurate responses. Understanding the cards and answering the questions accordingly. Providing guidance and decision making by Tarot cards. Remedies according to the problems relating to finance, education, relation, love, marriage and career. 7 chakras of our body and its meditation. A basic Pendulum Drowsing course will also be included in it. Tarot reading course materials and the deck will be provided. Pendulum will also be provided. The course will be taken for 2 days. Upon successful completion of the course a certificate will be provided. For further details about tarot or to book an appointment or to enrol for a tarot reading course please contact Swetha on +91 97389 72263 or drop a mail to tarot@newlifemth.com . very good hopefully it will benefit me. thank you for your support. Im glad i decided to try once tarot reading. there were many hidden secrets behind which i didnt know and it helped me and my family in coming out of problems. thank you may god fulfill all your wishes. very good work done and reasonable compared to others. satisfactory but a weird experience. Had a Tarot Session with Swetha. Amazing guidance. Thank you! I am happy with the session and will strongly recommend it. It was a great experience for me . I got to know the major problem of my life condition. Im very much glad to come here. got answers for many questions about which we didnt know where to ask or whom to ask thanks for it. felt good felt relieved, mainly got answers other things we have to follow and do. I was surprised to know the reasons behind my problems. i would never imagine anything like this or may be know one even would know there would be such a problem. whatever she said was true and thanks for solving my problem. now im happy and its really nice to know my child also is happy now. An absolute eye opener… Thanks for the guidance. I had taken course and she is very professional in her way to explain and speaks in very simple language. I’m happy and would recommend it to. I’m still thinking how does this think work but yes it does. I’m very Happy with her positive nature and answers you don’t feel like your speaking with a tarot card reader thumb’s up. Course was really nice especially the practical class.